Now, for some reason I thought it was this week, so I’m planning to ride to work tomorrow. It’s about 8 miles, which means I should be able to do it under an hour at a comfortable pace. If for some reason something goes wrong (flat tire, get hit by a car, fall in a lake) I’ll be calling one of my co-workers who drove to come pick me up. I’m all in favor of riding to work (Ernesto the Biker does it!) but it’s just not always practical. I mean, I left work at 2:30 AM the other night, so riding home would not have been too pleasant. 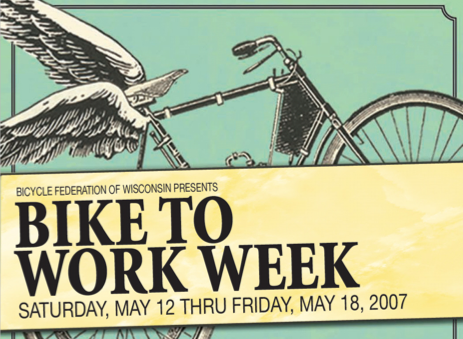 Anyway, if there is a chance you can ride to work next week, do it. You probably need the exercise. Posted on Thursday, May 10th, 2007 at 7:50 am. Subscribe to the comments feed. Both comments and pings are currently closed. Post on your own blog.